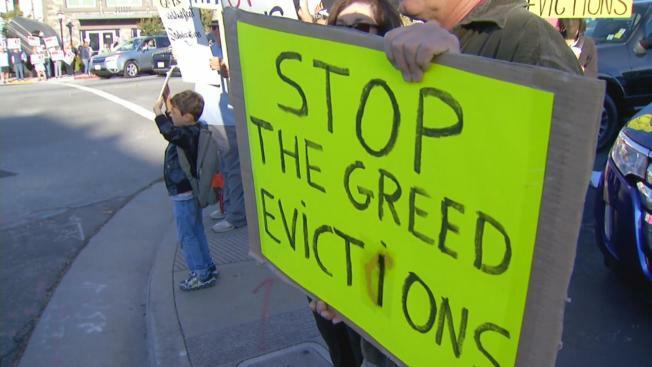 Rent Control supporters gather in Mountain View ahead of the Nov. 8 election. In a major coup for tenants' rights groups, The California Apartment Association — one of the largest landlord groups in the state — has dropped its legal challenges to Mountain View and Richmond's voter-approved rent control laws. The association announced the decision Friday in a statement to members, writing that the "judicial climate" and failed attempts at injunction made it necessary to re-evaluate the suits' ability to succeed. Richmond's Measure L was approved with more than 60 percent of the vote in November. It caps annual rent increases in apartment units built after 1995 to the rate of inflation, between 2 and 3 percent. Mountain View's Measure V passed with just over 53 percent of the vote and prevents rent hikes on apartment units built after 1995 from exceeding 5 percent. Both laws included provisos protecting tenants from unfair evictions and included rollback provisions, meaning some renters actually saw a reduction in their monthly rent due to the laws. The CAA filed suit against the cities shortly after the election, claiming that Measure L and V were "unconstitutional" and "vague." Judges in both cases shot down requests for preliminary injunctions and had allowed rent control to continue while the lawsuits worked their way through the courts. Leah Simon-Weisberg, a managing attorney at Centro Legal de la Raza who helped draft Measure L, said she was hopeful that the suspended suits would provide reassurance to other cities considering rent control. "We're glad that the CAA came to their senses," Simon-Weisberg, who also serves on the Berkeley Rent Board, said. "We really need rent control, and we don't want other cities to be afraid that they're going to have to deal with frivolous lawsuits." In 2015, Richmond became the first city in 30 years to pass rent control, but the CAA successfully thwarted the ordinance from taking effect via a controversial petition drive. In 2016, when rent control was once again approved as Measure L, there was concern among proponents that the landlord group would return and squash it from taking effect. Richmond City Councilmember Melvin Willis said Measure L supporters are finally getting a chance to celebrate a "victory" that was years in the making. "It's a huge relief because having this court case hanging over our heads presented a small amount of uncertainty as to what the future of Measure L would be," Willis said. "You never knew what was going to happen." Though the lawsuits have been dropped, Simon-Weisberg and Willis said that tenants' rights groups must still be cautious moving forward. Willis noted that some renters in the city are continuing to get eviction notices and rent hikes made illegal by Measure L.
"Right now we're focused on getting out there and letting people know what their rights are," Willis said. "There are still tenants that are not getting their rollbacks or are being evicted unfairly, so we need to make sure that rent control is implemented, and implemented the right way." Simon-Weisberg echoed Willis. She said the dropped suit signified an "important moment" for renter protections, but cautioned city leaders and tenants' rights groups against growing complacent. "We always need to have strong regulation," Simon-Weisberg said. "There's not going to be some final battle that ends it all, and now it's all rosy. We will continue to have to ensure that this ordinance and ordinances around the state are strong." She continued: "The reality is, the other side just has so much money that they can make by preventing rent control or weakening it. You can never say 'ahh, it's all over.' It's never done."